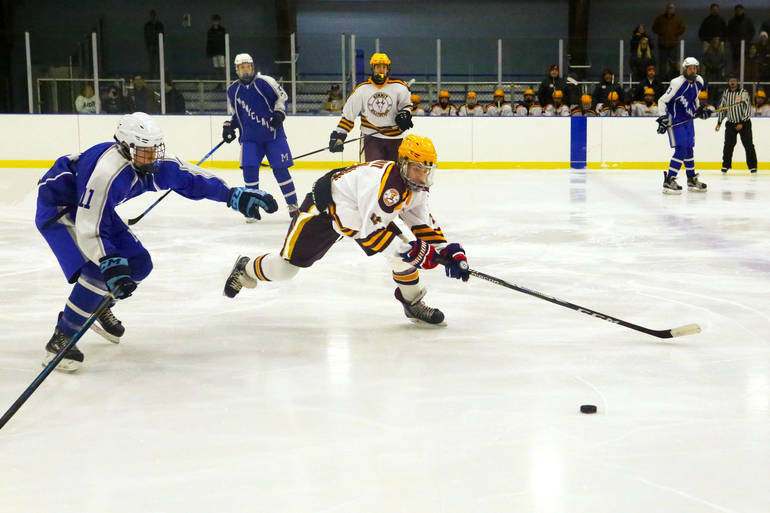 ROSELLE, NJ – Outshooting their opponents 39-15, the Summit High School Boys Varsity Ice Hockey Team began their 2019-20 season with a 2-1 victory over Montclair at Warinanco Skating Center. First-period goals from sophomore Greg Spitznagel and junior Jake Puskar gave the Maroon and White a 2-0 lead, but they could not get another puck past Mounties goalie Lucas Podvey the rest of the evening. Freshman Grant McCormack, starting in net for Summit, stopped 14 shots and allowed just a second-period Montclair power play goal. Senior captain Charlie Collins and classmate Luc Radice had assists for the Hilltoppers (1-0), who will next face Livingston at Codey Ice Arena in South Orange on December 1. The puck drops at 5:45 p.m.